It was Cruise Night in Red Bank, NJ last night and at about 5pm I looked up and sitting outside the window to our store was THE BAT MOBILE!!! It was on a flatbed but obviously it was heading for Broad St to be part of the car show. 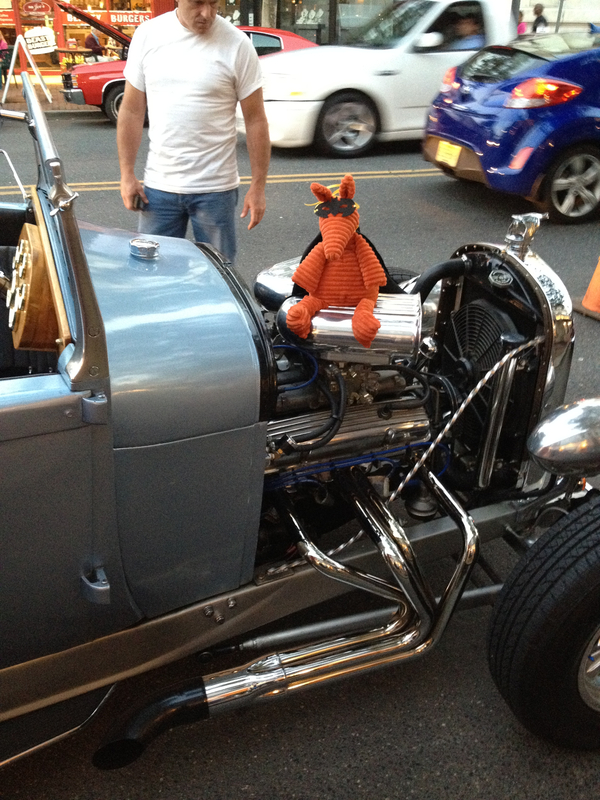 Ten minutes later The General Lee drove by and we decided Cruise Night might be worth checking out. Clive was so excited he decided to go in costume. So we closed the store and Batman went in search of his wheels. 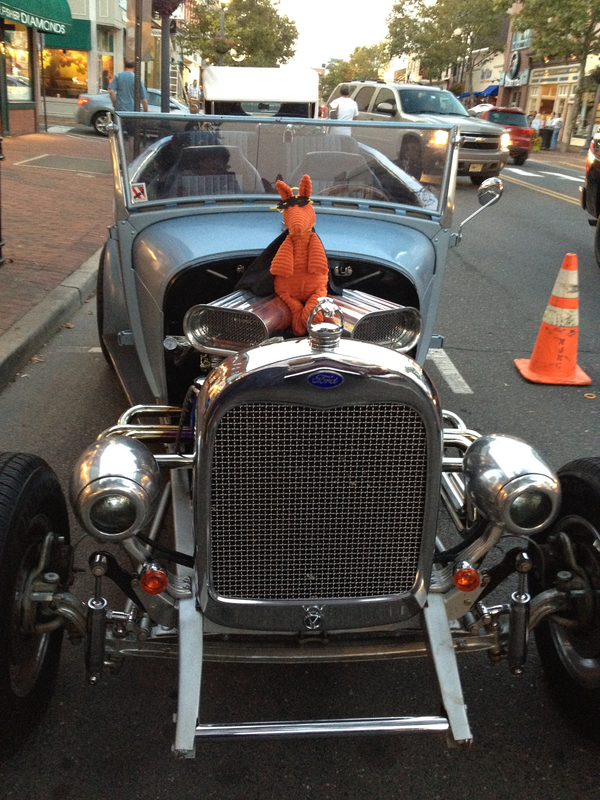 We searched up and down Broad St but the Bat Mobile was nowhere to be found; no signs of the General Lee either. 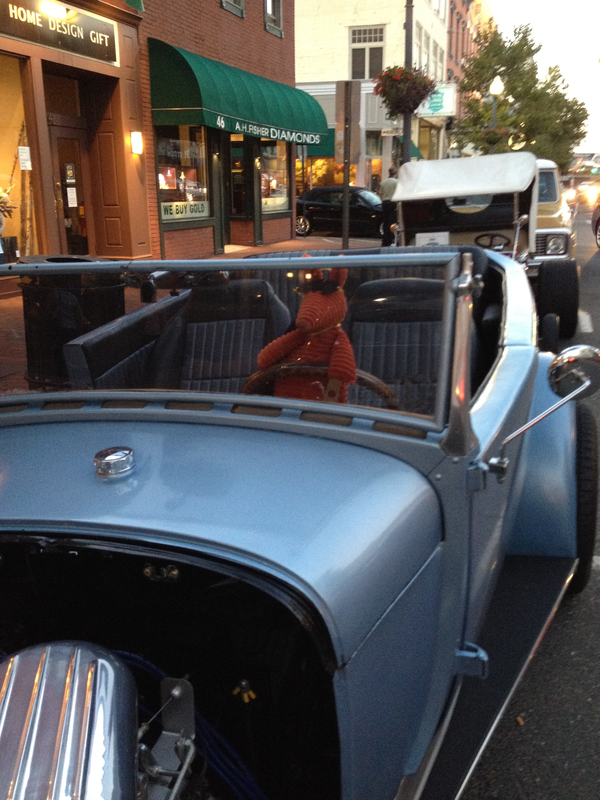 So, being an enterprising aardvark, Clive/Batman decided to go searching for some new wheels. This one wasn’t right, so our search continued until we found this beauty. Yes this one will definitely do! 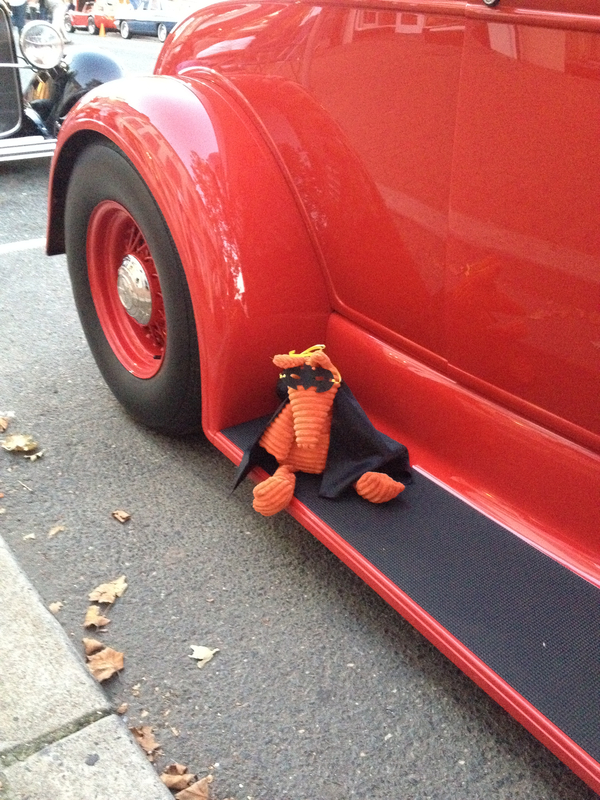 Thanks so much to the car owners, for allowing Clive/Batman to pose with your cars. 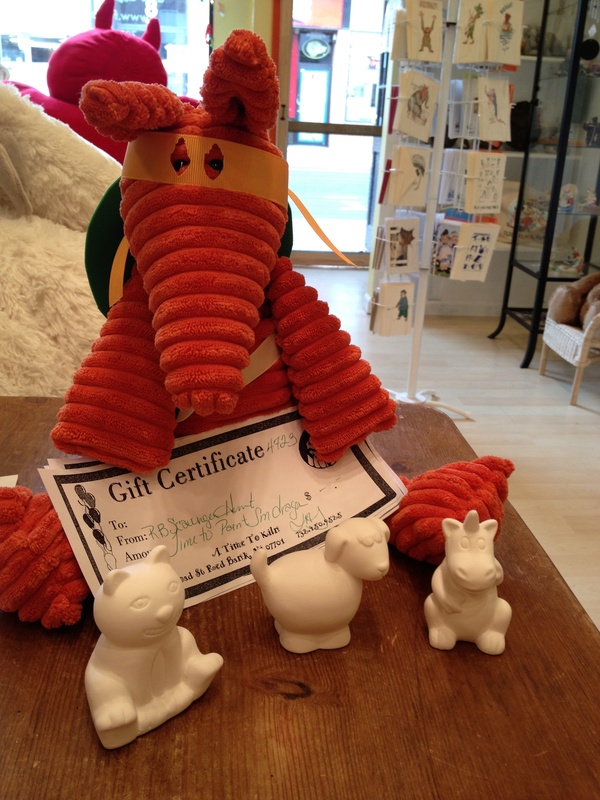 **Clive is a Jellycat Cordy Roy Aardvark and can be purchased either through our online site, Fragile Earth Stuffed Animals, or in our store at 9 Monmouth Street, Red Bank, NJ. Clive, Red Bank’s Torch Bearer, Takes a Break to DANCE!!! Clive, Red Bank, NJ Olympic Torch Bearer, was doing great yesterday sticking to his assigned route. Then late in the afternoon, he was nowhere to be found. We did eventually find him trying to sneak into the Two River Theater’s auditions for Red Bank Bolero. 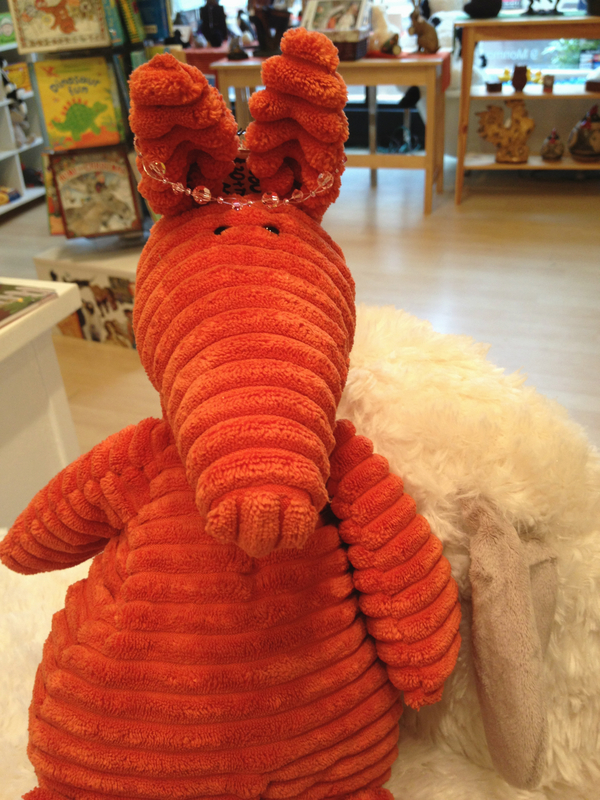 Clive is surprisingly graceful for an orange aardvark with very short legs. Watch out So You Think You Can Dance!! Don’t worry, he should be back on track tomorrow. Then, exhausted from his journey (short legs), he stopped to rest on a bench on Front Street. 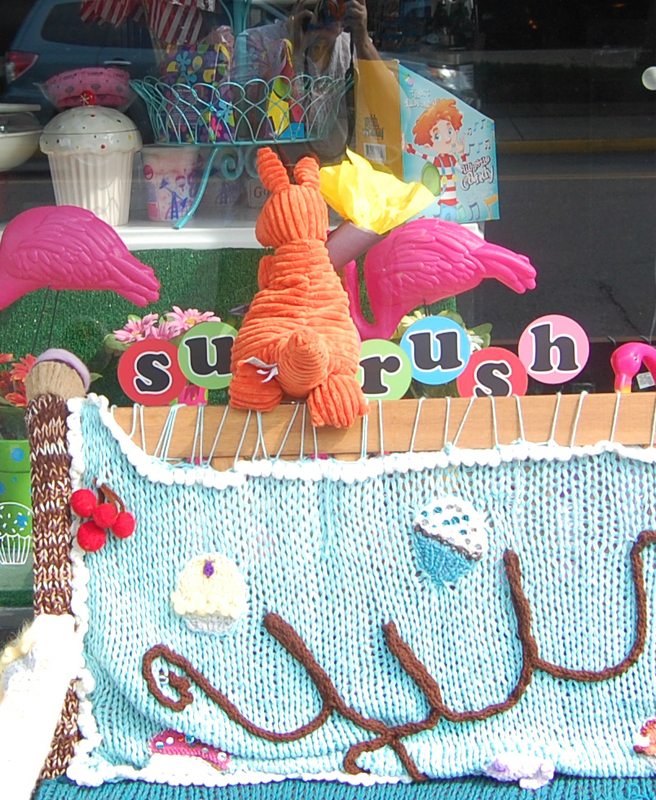 If only this delicious cupcake eatery were open; rumor has it, they (Sugarush) have the best cupcakes in all the land. Aardvarks LOVE cupcakes!! Stay tuned to see where our intrepid torch bearer shows up next. 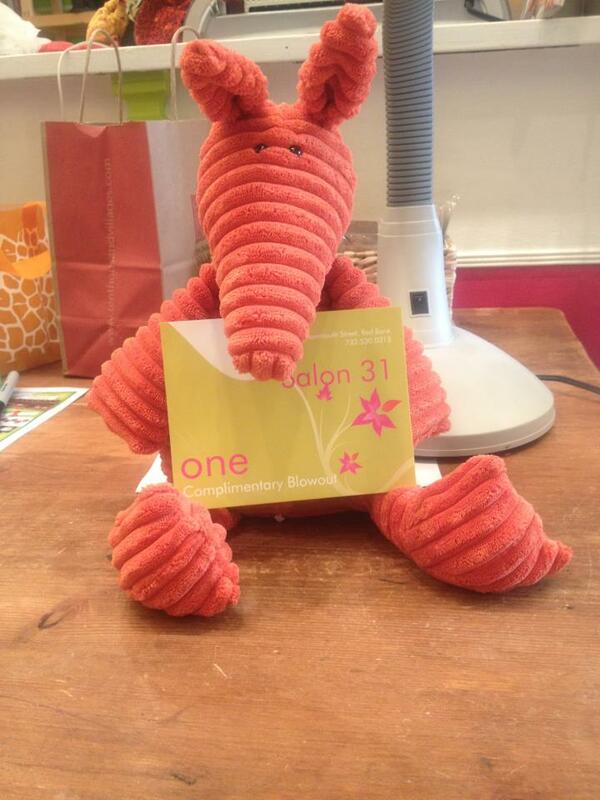 **If anyone is interested, Clive is a Jellycat Cordy Roy Aardvark and he may be purchased from Fragile Earth Stuffed Animals either online or in our store, 9 Monmouth Street, Red Bank, NJ. We apologize for being a little absent from the blog recently. 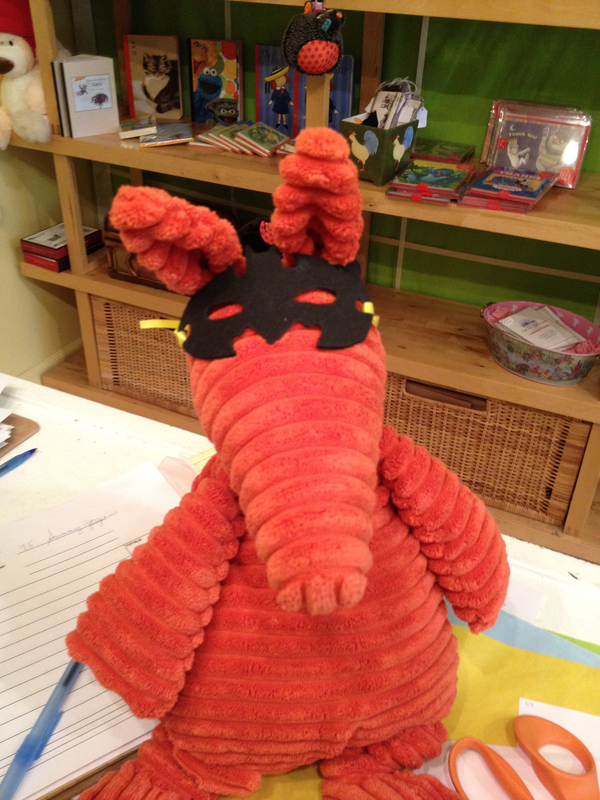 We are busy preparing for our Treasure Hunt in Red Bank, NJ this weekend, June 30th to be precise. Red Bank is known for many things but one of the main draws to town has been their annual July 3rd fireworks display. For budget reasons, the powers that be, in their infinite wisdom, decided to cancel this year’s display. This is huge for local businesses because the fireworks would bring THOUSANDS of people to town for the day. 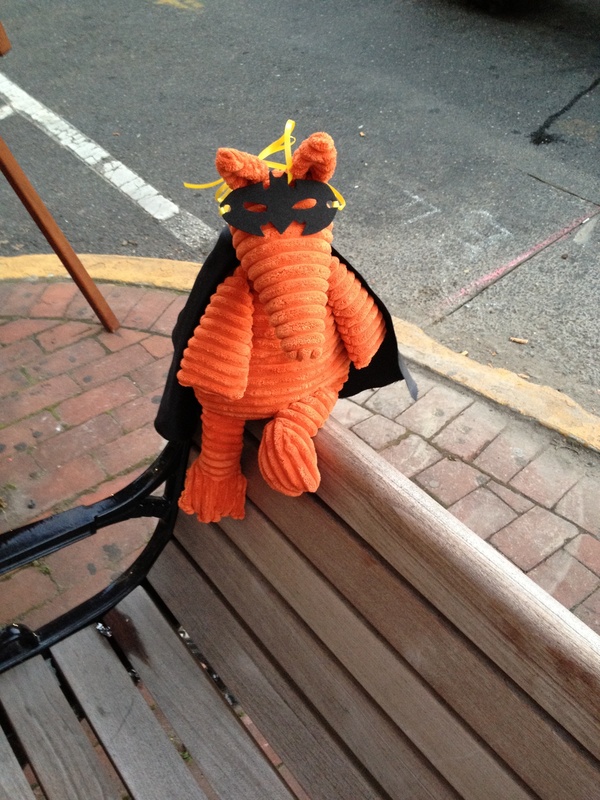 In an effort to do something for the 4th of July, Fragile Earth Stuffed Animals has created a treasure hunt around town. You start at our store and pick up your map and loot bag. The map will take you to other stores in town where they will give you a clue to your final destination as well as a little something for your loot bag. 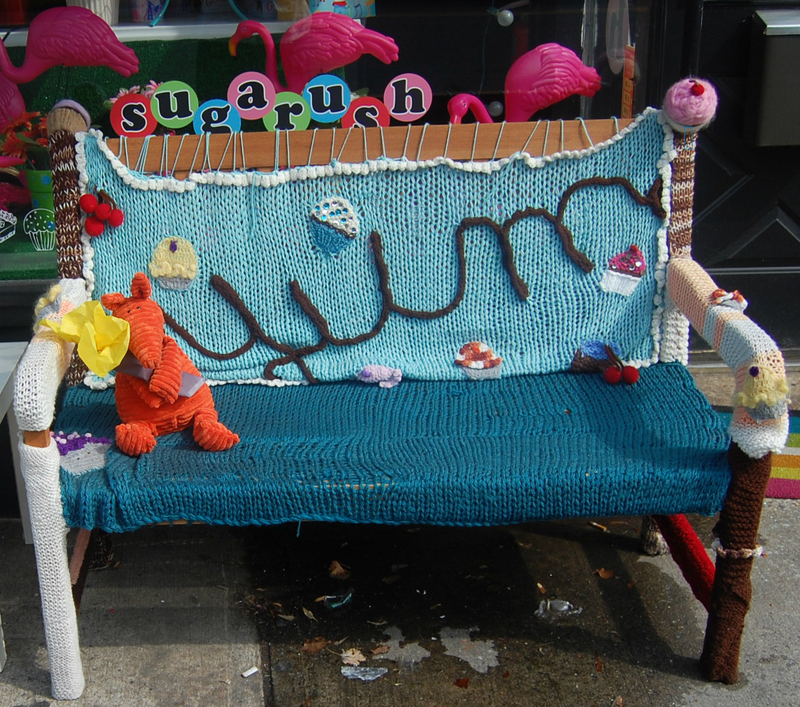 If you are in Red Bank, NJ this weekend, stop on by 9 Monmouth Street for your treasure map. Don’t let a little 90 degree heat and NJ humidity scare you away. George is resting up, saving his energy. I just wish we could do the same. 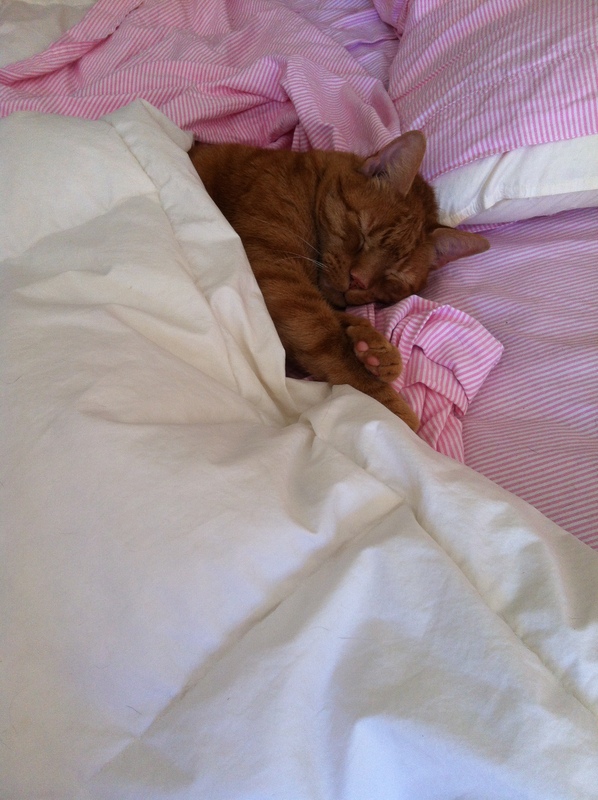 We just took the picture, he tucked himself in.